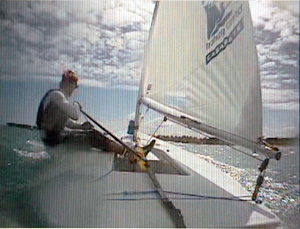 A DVD that teaches how to maneuver your boat and sail like a champion. In Advanced Laser Handling, you will follow 17 sailors who raced in the 2008 Beijing Olympics Games, including three medalists. You will see them practice and prepare for the games at the Laser Training Center in Cabarete, Dominican Republic. 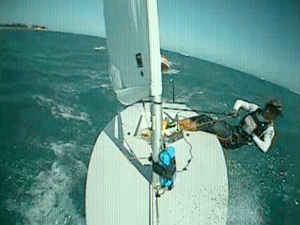 This is the first look at the footage that these top sailors used to improve their skills. Using different viewing angles, including coach, on-board and aerial cameras; sailors can see step-by-step images with over 50 minutes of video on how to master maneuvers throughout any racecourse. With the third and final installment of APS' Civil War (in Lasers) set to take place this Sunday, it was a natural time for us to take a look at a new Laser DVD that we're carrying here at the shop: Advanced Laser Boat Handling. Both "Tacks" and "Gybes" are discussed in relation to wind conditions: light wind (0-8 knots), medium wind (8-16 knots) and heavy wind (16+ knots). The "Around the Marks" section is broken down into Windward Mark and Leeward Mark roundings, where you may happen to notice the LTC's very intelligent use of APS' Race Marks. "Penalty Turns" is its own section, but let me sum it up for you: don't foul people. I kid, but seriously... stop hitting other boats. If I got anything from watching these relatively good sailors do penalty turns, other than motion sickness, it's that even really good sailors lose a ton of time going in circles. The first camera was mounted in a coach boat, following sailors. And, unlike some footage I've seen filmed in coach boats, the camera work is very steady and there's almost no "jumpiness". The second camera was mounted to the front of a Laser, looking back into the cockpit. This angle was cool, but the mast and sail tended to be in the way of some of the footwork in the cockpit. Was helpful for views of body positioning and rudder movement. The third camera was mounted on the back of the Laser, looking forward, with a good angle into the cockpit. This was my favorite angle because it was mounted a couple of feet off the stern and about 24" - 30" high. This allows you to see into the cockpit clearly, observing the footwork of the sailors while also seeing the entire boat. A very, very cool angle. The last camera angle that was sparingly used was from a helicopter. In truth, there's maybe 25 seconds of helicopter footage, total. But it counts... I guess. The producers also showed a number of the maneuvers a few times in a row, running them back and playing them again. Each time they do this, they break down a different part of the tack/gybe, going into detail about the necessary mechanics of footwork, weight placement, rudder movement, etc. and the gains to be made. They didn't try to squeeze all of the information into one run of the maneuver, chucking a ton of information at you quickly. Descriptions were deliberate and complete. Each section has this 30-ish second intro by the Laser Training Center's coach, Rulo Borojovich, that's completely unnecessary. He stands in front of a Laser on the beach and basically says: "Hi, this is important. Let's find out what to do". Thanks Rulo. My $0.02 is that there probably wasn't enough emphasis put on choppy/wavy conditions. They address these conditions briefly in a number of places, but I kind of think those conditions should be larger focus areas. Hitting tacks and coming out with speed in flatter water is a lot easier than it is in chop -- and the consequences of screwing maneuvers up in chop are way higher. Coming to a complete stop tends to hurt your performance. 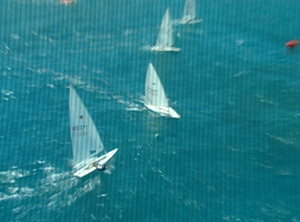 These guys know what they're talking about; a number of really good sailors go to them for training. Overall, this DVD is laid out well with some really excellent camera work and footage. Shot in the dark, but the majority of us are, in all likelyhood, going to get a lot out of this DVD. Books are great, and you can read a description and see a still image of a good tack, and it certainly helps. But there's just something about watching it done live, being able to rewind and review it whenever you want, while getting that same level of description that really is invaluable. 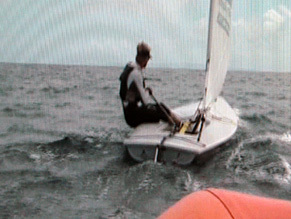 When I was coaching junior sailors in the Laser (most of whom didn't completely bail on sailing after the experience; there are two that still suffer from PTSD though...), I always found that getting into a boat and having the kids watch what I was describing worked 1,000 times better than just talking at them and showing them diagrams. At ~$50.00 for the DVD, you get a one hour lesson (cheap for a good coach) that you can continue to use and review before/after racing or practice. In the end, despite some shortfalls in the description levels for certain conditions, I'd highly recommend it.